Good evening! 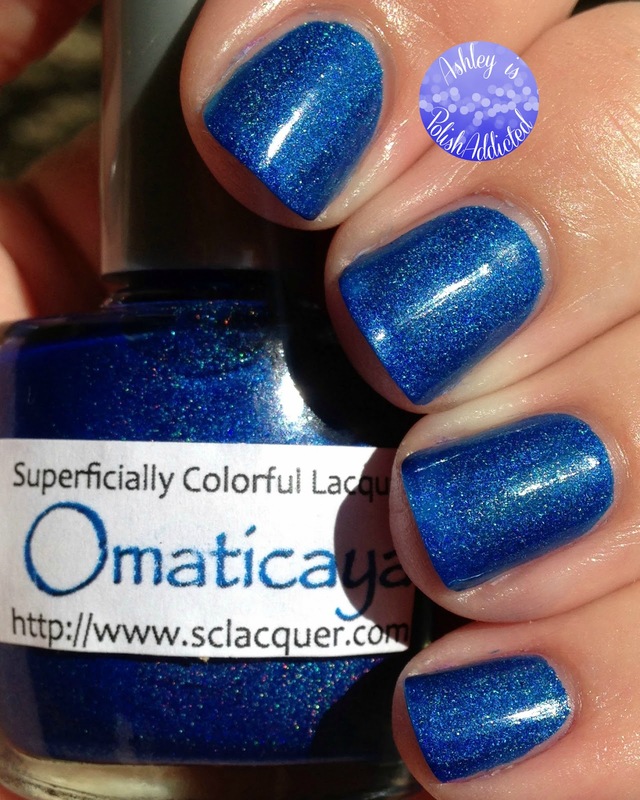 I have a brand new, super gorgeous collection from Superficially Colorful Lacquer to show you tonight! These will launch August 1st at 3 PM EST/12 PM PST. (That's less than 24 hours from now!) This is a long post so get comfy! 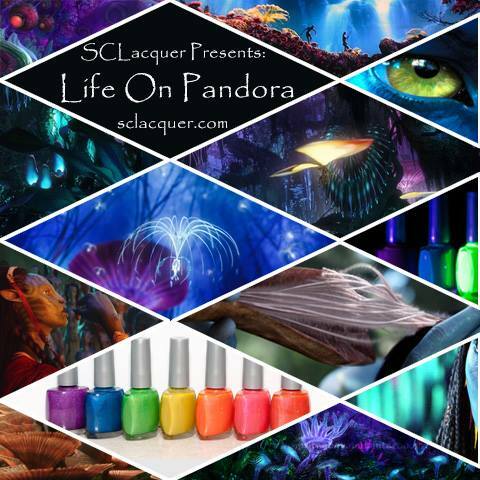 The Life on Pandora Collection is inspired by Avatar and, I must say, these gorgeous colors definitely live up to the vibrant colors in the movie! 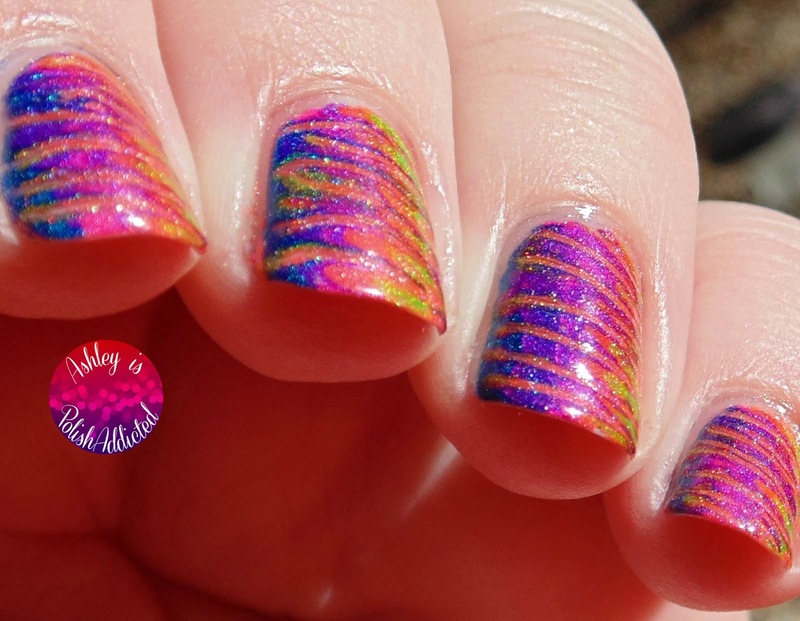 There are 7 polishes in this collection and each and every one is a vibrant neon holo that will knock your socks off! These polishes also glow under a blacklight! Unfortunately I do not own a blacklight so I can't show you that but you can see the bottles glowing in the collage below (right side). The formula on all of these was smooth and easy, some were nearly one-coaters! 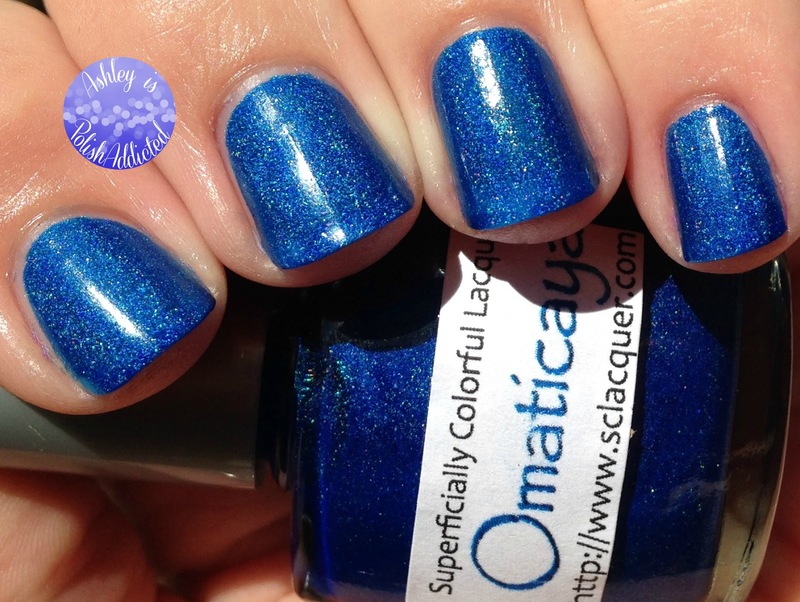 I am showing all of them with 2 coats with one coat of top coat on the ring finger only. They dry to a satin finish and I actually prefer the softer finish without top coat than with the extra shine. They also dry smooth to the touch. The only issue I had with them at all was in 3 of them - Omaticaya, The Sacred Tsaheylu and Tsahik - there were a couple bits of pigment that weren't completely dissolved. 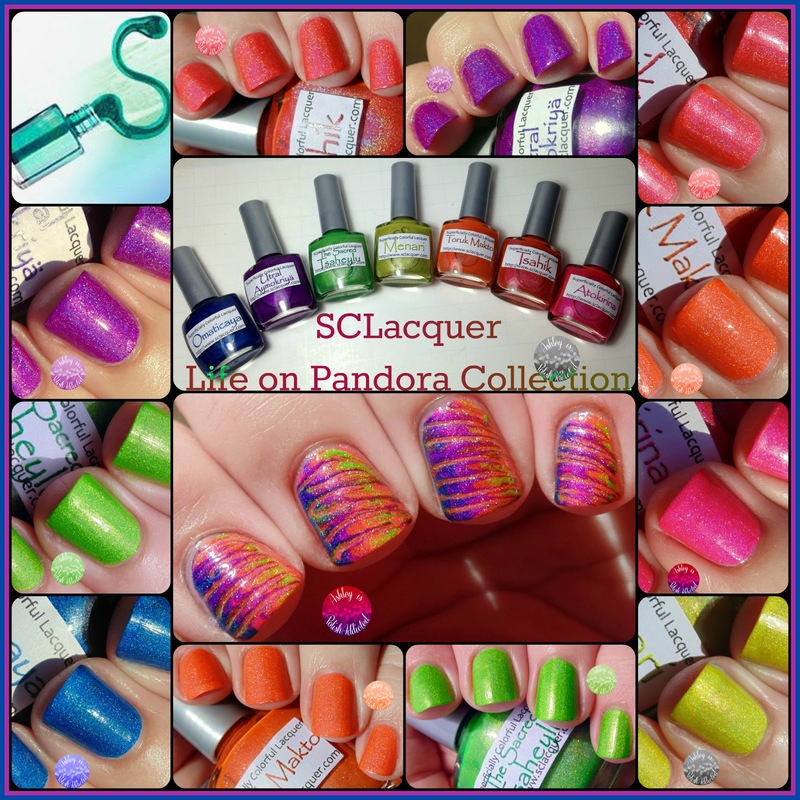 I notified the lovely lady behind SCLacquer and she said she would work to get it fixed ASAP! It wasn't problematic and would not keep me from purchasing these. I will go into detail on the nail art after the swatches but here is a little preview. "A bright holographic pink polish that represents the sacred seeds of the Tree of Souls that lives on Pandora. Atokirina us the Na'vi word for woodsprite. A very pure and sacred spirit that represents the plant's life force." If you've been following me for awhile you will know that I'm not a "pink girl" but I really love this pink! It is bright and bold and just plain fun! "The meaning of the word is eyes. 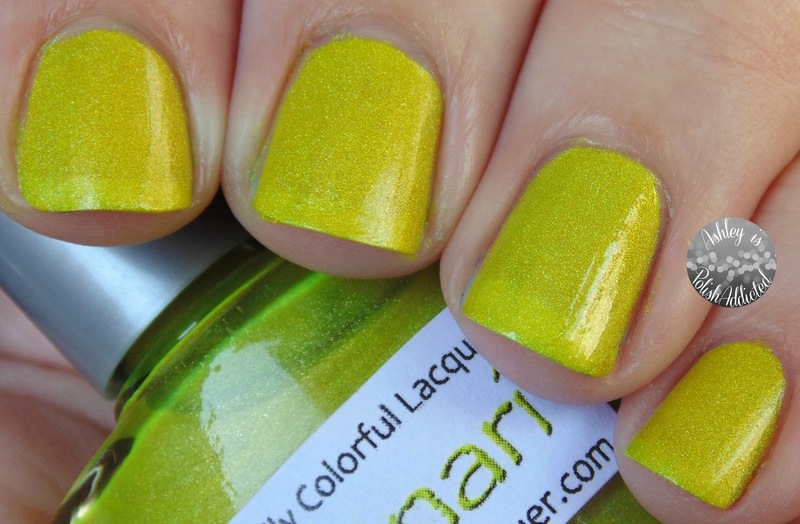 And the polish is bright neon yellow with a little bit of green undertones. Inspired by the big yellow eyes of the Omaticaya people of Pandora"
This one is slightly more green and less "lemon yellow" than it looks in my photos but it is just as bright! 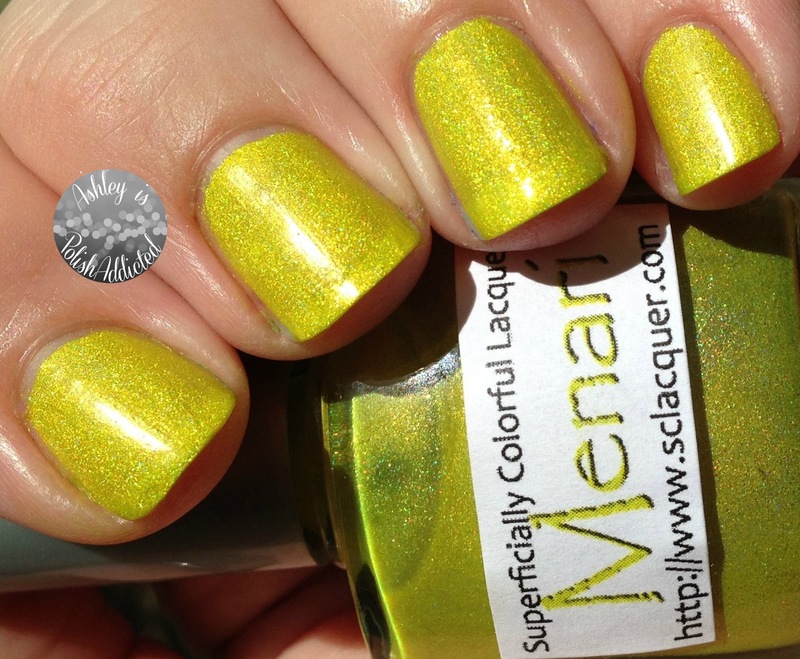 This is a very unique shade, I don't think I've seen another yellow like it! "The name is translated (in the Na'vi language) into Blue Flute Clan. 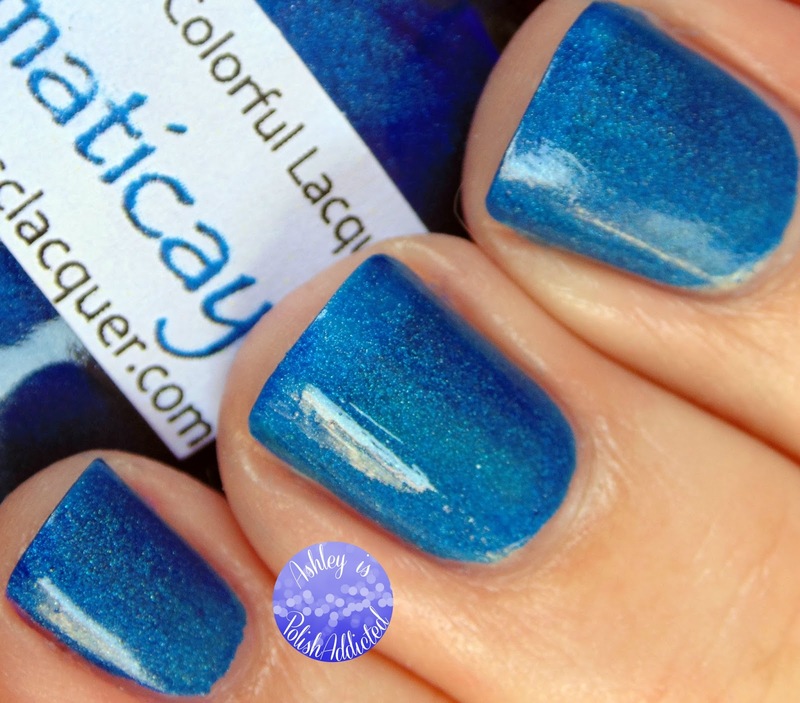 It is a medium bright blue holographic polish inspired by the nationality of the people living on Pandora." When I think Avatar, I think blue (as I'm sure most people do!) 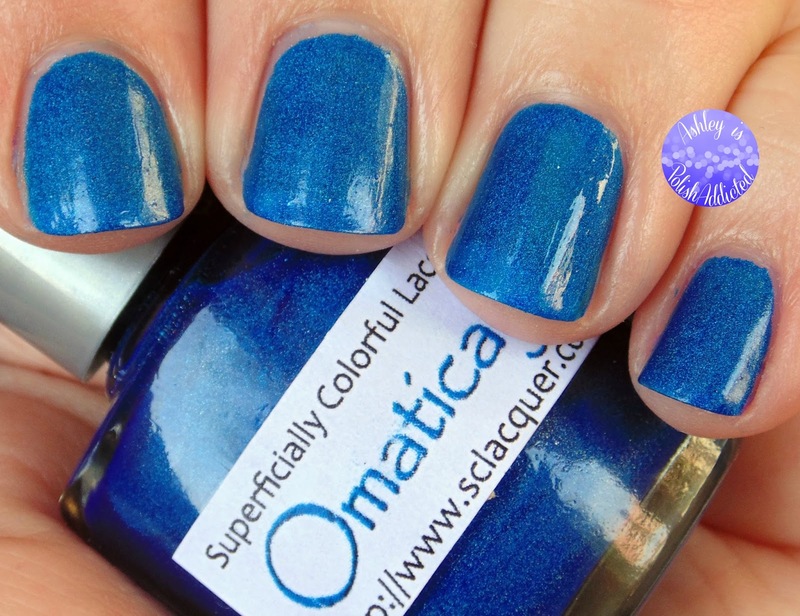 and this blue is really one of the best blues in my collection. It is bright and deep and glowy all at the same time! Definitely a must-have! I had a hard time capturing the true color of this one. The next pic, in artificial lighting, is the true tone of this color. "An apple green holographic polish inspired by the magical connection the people of Pandora have with nature. The meaning of the word Tsaheylu in Na'vi language is bond. Neural connection." I have to apologize for my pics on this one. When I was taking pics a dust storm was starting to roll in and it was getting overcast so the sun pics aren't much different than the shade pics. It is definitely an in-your-face granny apple green! 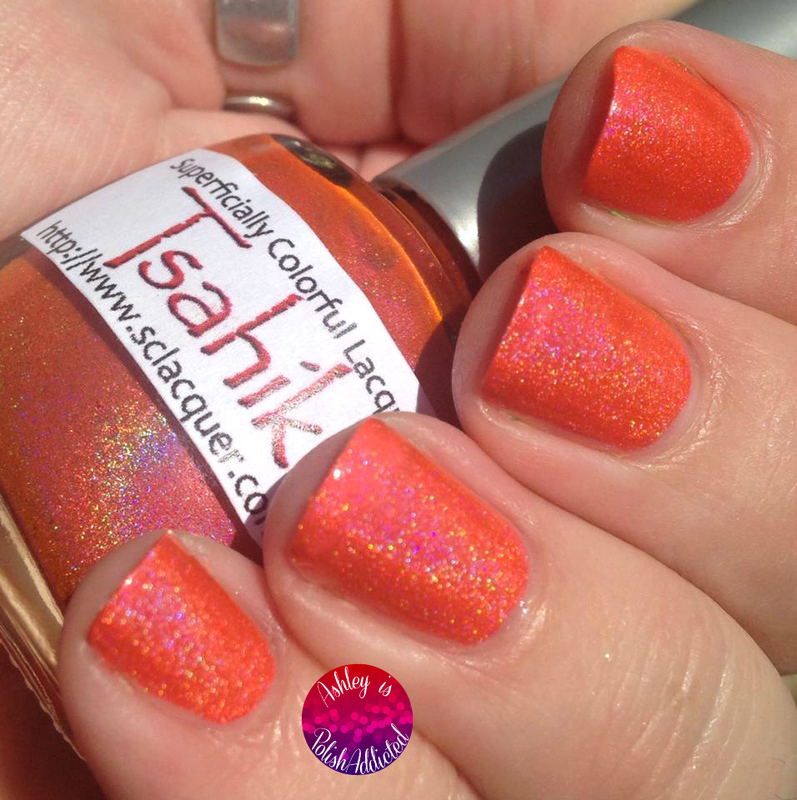 "An orange holographic polish inspired by the brave rider of the Toruk - the great red-orange leonopteryx." 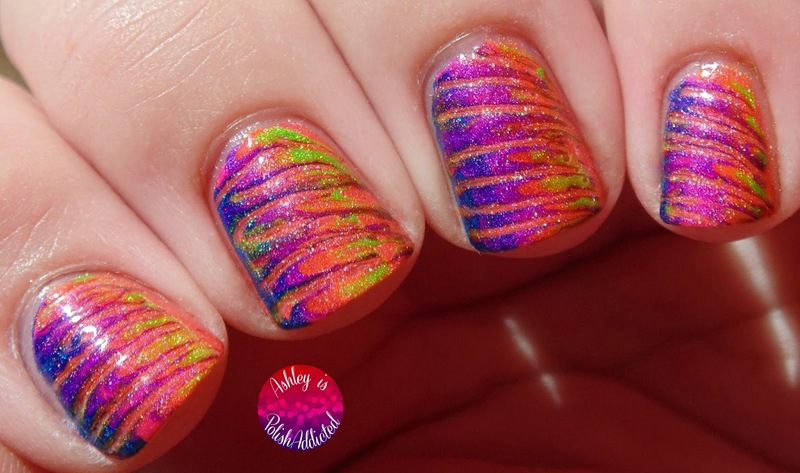 Juicy, orange and holo - it doesn't get much better than that! One of my favorites from the collection. "A red leaning purple holographic inspired by the special tree where the Omaticaya people can hear the voices of their ancestors." I saved my two favorites for last! This one is just a perfect red-leaning purple and I'm going to need backups! Purple perfection. 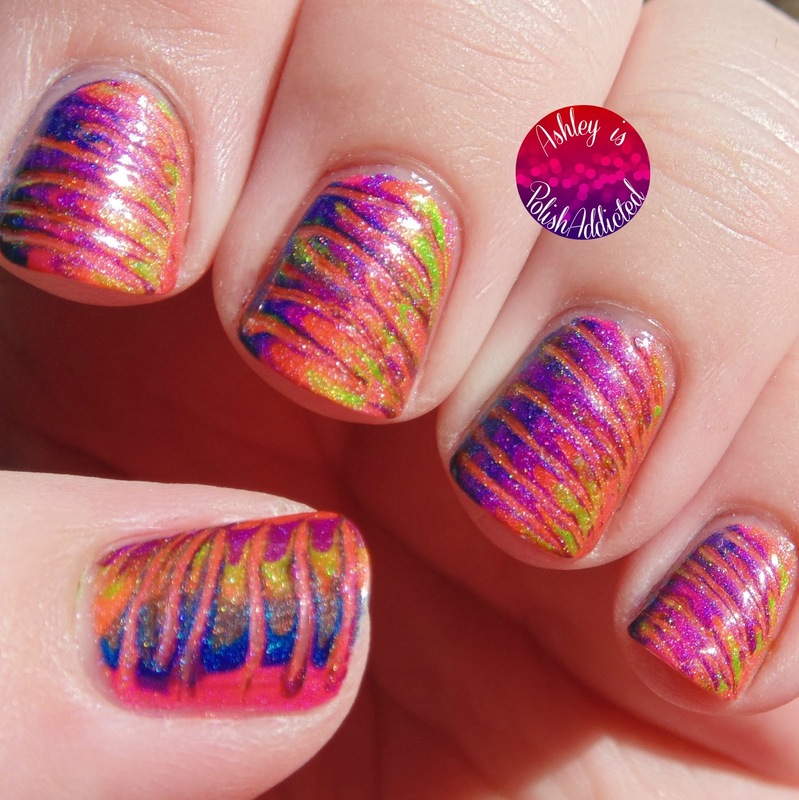 "A bright holographic orange-red polish that is inspired by Mo-at - the Tsahil of the Omaticiaya clan. The Tsahik is the spirotual leader of a Na'vi clan, and the most important female member." This is my #1 from this collection! You know I love a good coral and this one is absolutely stunning. So now that you have seen the stunning polishes, here's a little nail art I did with them! To create this look I followed the toothpick marble tutorial from Pointless Cafe. (Click here to check it out!) It was much easier than I expected! Just make sure you aren't too heavy-handed with your dragging and don't get the polish too thick! Whew! That was a long post - but a long post of gorgeousness! I would love to hear your favorites in the comments! Which ones are you going to pick up? These will launch August 1st at 3 PM EST/12 PM PST. These are available in the shop on the Superficially Colorful website and she ships worldwide! Every one of these colors are fantastic! The artwork you did to show them off is incredible! 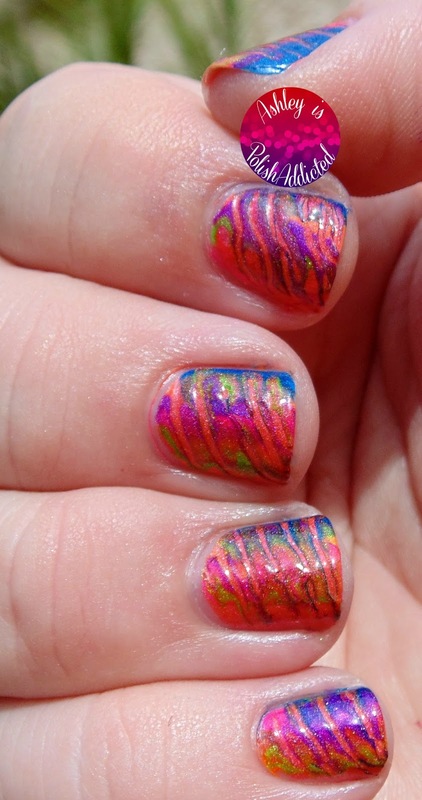 I can't wait to get these beauties :) I love your swatches, and the toothpick marbling looks great! Thank you so much! I am sure you will love them! holy moly! love the yellow and pink ! Great swatches! 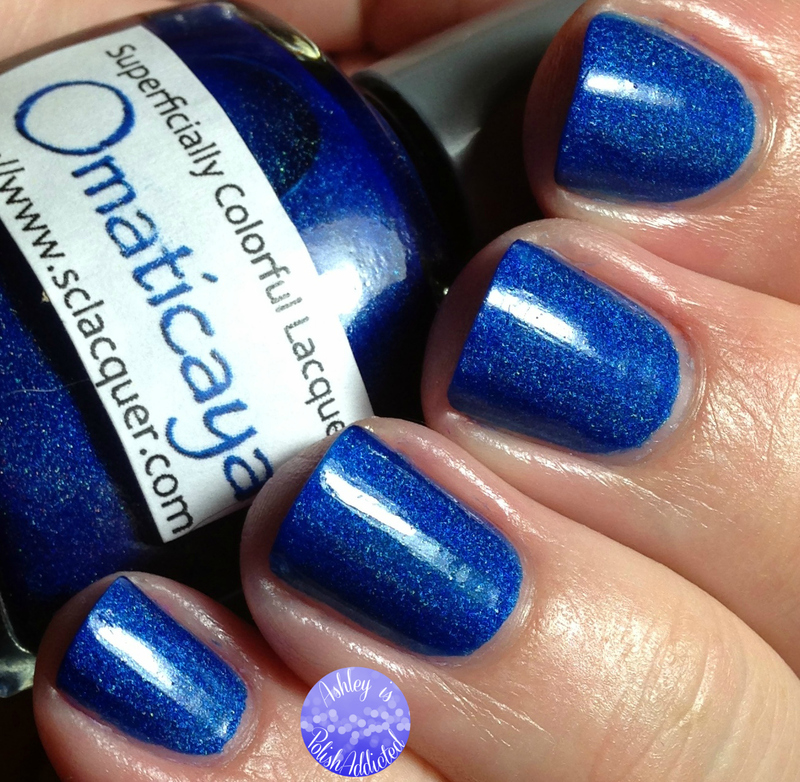 I've got a couple of these polishes on the way to me.